Thanks to the Starz FilmCenter, you can see yet another classic on the big screen. Even if you hae a really big TV, you will not see the same amount of detail as you will on film, so do yourself a favor and take yourself to the movies. Dr. Miles Bennett (Kevin McCarthy) returns home to a small California town. Becky (Dana Wynter), the girl he left behind is conveniently still single, looking lovely in the strapless dress and pearl earrings she wears running lunchtime errands. An old friend asks the doctor about her uncle Ira. He’s perfectly normal in every way, and yet there’s something different about him. There’s no emotion behind his words, even though his inflection is still the same. A man of science, Miles assures her that it’s probably nothing. Miles thinks nothing of it until he almost runs over a boy who is running away from home. He refuses to return to his mother; he says she’s not really his mother anymore. A third, and then a fourth patient tells him the same story. So-and-so isn’t the same person anymore. When the doctor is called to a friend’s house to investigate an unidentified corpse on the pool table, the story starts to unfold. The body is a blank. It looks remarkably like the homeowner, but it’s not quite fleshed-in yet. Apparently bodies are being grown, somehow, in the shape of their hosts. The blanks soon take over the mannerisms and memories of the hosts, replacing the human with the snatcher. They eventually find the source of the blanks, giant cabbage-like plants that ooze slime. Miles and Becky have to try to find help from the shrinking population of normal humans, while fighting off sleep, which is when the snatchers can take over your body. 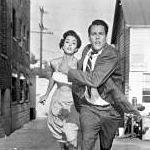 As a thriller, Invasion of the Body Snatchers is good. There are some genuinely creepy moments, augmented by a musical score from Carmen Dragon. Later in the film, our protagonists literally don’t know whom they can trust. The uncertainty and wariness is chilling. And though some might find the pods a little cheezy, I found their organic simplicity to be an excellent “special effect” for the price. But the best, creepiest, most effective scenes earn their power by their context in this movie. A small park at a downtown intersection bustles with activity. It’s pure Americana — a scene you could find in any small town on a Saturday morning. And yet, it’s the scariest scene in the movie because we suspect that most, if not all, of these people are inhuman. And when the townspeople suddenly move with their hive mind, you might just jump out of your seat. Taken as a whole, the movie doesn’t fare so well. The chase scene up through the hills saps the movie of its momentum. The third act is drawn out too long (although the ending scene works pretty well). And although there is some very good social commentary in Invasion of the Body Snatchers, it’s a little scattered for my tastes. But even if it’s scattered, the social commentary still raises Invasion of the Body Snatchers to near the top of the list of great horror movies. The horror in Body Snatchers comes in part from the fact that we can’t tell our friends from our enemies. In 1955, that probably resonated with the anti-communist sentiments in the United States. You can’t tell a commie just by looking. They could be anywhere! Another part of the horror is the oppressive conformity (kind of like a zombie movie, but less so). Those who’ve been assimilated lose their identity and their will, and worst of all, they don’t even know it. This part of the horror is a little more subtle, at least to a rationalist such as myself. The fact that the old you and the new you are so similar is viscerally disturbing, but it had me scratching my head — if the average person can’t tell the difference in the victim, then how is he really worse off? Becky describes the potential outcome: “an untroubled world where everyone’s the same; no need for love, desire, ambition, faith.” There are some days where, to me, that sounds pretty good. But in 1955, that also probably sounded like creeping Communism, and it was may have been more ominous then than it is now. Nevertheless, my own generation produced the Borg, those hive-minded villains on Star Trek. And Shaun of the Dead, Dawn of the Dead, and 28 Days all opened within a year of each other, and they went over very well. So Invasion of the Body Snatchers tapped — taps — into something in us that we still fear today. Perhaps that’s why it’s such a lasting movie.